It would also add some support to the claim by Gibert of a bone found in that same cave in 1983 being part of the skull of an archaic human, the so-called Orce Man, which he dated to 1.3 Ma. Back in the day the finding was strongly contested and even claimed to be an equid's scapula, however the debate has not yet settled and it seems that these days only creationists are heavily opposed to Orce Man being real, while the scientific establishment remains divided. The son of Josep Gibert, Luis, laments in interview by press agency EFE (published today at Diario Vasco, for example) that some people (in direct reference to IPHES' director) still discredit his father's work but he feels happy about the tooth finding. 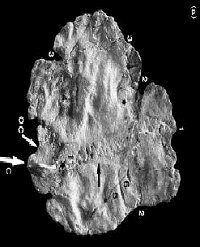 Publication of the relevant paper has been delayed after Luis Gibert asked the Journal of Human Evolution why a tooth fragment, dated to 1.25 Ma., published by his father Josep in Human Evolution 1999 (now extinct), is not even mentioned. Other works by Josep Gibert on Olduwayan tools found in the very same site of Barranco de León with dates as old as 1.5 Ma. are also ignored in the study's text and bibliography. For these reasons Elsevier has decided to provisionally pull back the publication until these works are cited. However the skull fragment was widely accepted initially as real. But then a small "occipital crest" was found in it, what led Lumbley to argue that it was a horse instead. Gibert lamented that instead of communicating this to him or otherwise debating cleanly, the French leaked this to the press surreptitiously and pulled strings within the circles of power of the Academia, a similar method of pseudoscientific disqualification by established "armchair scientists" to calumniate the findings of Iruña-Veleia.